Let your little one design their own personalized baby backpacks and make this milestone a fun, exciting adventure. Printed on both sides with your photos, drawings or text, it can easily be identified amongst other bags and prevent it from getting lost. It's 100% waterproof, so can withstand juice spillages and accidental puddle drops. This is the perfect gift that helps to encourage a positive attitude towards nursery school. 100% waterproof nursery bag 17.32" x 12.6"
This sturdy, strong personalized baby backpacks is the perfect accessory for your children's nursery school visits. Print your designs on both sides, and let your little one travel off on their new adventure in style. With waterproof and non-fray properties, you can rest assured it can withstand the energetic antics of toddlers and little children. Feature their name, favorite photos or cartoon character and let them show off their individual personality. It's also a great way to make new friends as it provides a fun conversation stater. Fill it with their toys, packed lunch and crayons, and watch as they embark on their journey to independence. I was very surprised when I received my order! I purchase numerous personalized gifts throughout the year from a couple different places, as well as a few random sites, and not always happy. This was my first purchase from your company and had no idea what to expect. I was completely shocked & extremely pleased with the quality of this item, I didn’t expect it to be such amazing quality.. I will definitely be ordering again soon, as I love personalizing my own gifts. Like many of our products, the personalized backpacks for kindergarten comes with a quantity discount, so treat all your children, nieces, nephews etc to a new bag and save money at the same time. Handmade to order in our studios by skilled seamstresses and technicians, your personalized drawing backpack is a unique gift for little ones. Your images and designs are permanently printed on both sides using a special process that fuses the inks deep into the Linden Waterproof fabric fibers. This ensures a lifetime print that will remain bright, vibrant and crisp for years to come. The material is hand cut to size, where metal eyelets are punched into the corners, reducing the risk of important features of your photos being cut out. We add light stitching across the top where the drawstring functionality is, however, this won't impact your photo. The string we use is durable, and can easily be adjusted to suit your child's frame. Care Machine wash at 30°c as often as needed. The print is permanent so won't fade even with regular use and cleaning. Please bear in mind the position of the metal eyelets in the bottom corners. If including your child's name, for example, you'll want to check that the letters don't sit where the fabric will be cut to compensate for the eyelets. Within the design interface, this is clearly marked out. Make the most of our double-sided printing and use one side for a photo and the other for more practical information, such as the child's name and the name of the nursery they attend, just in case anything gets lost. 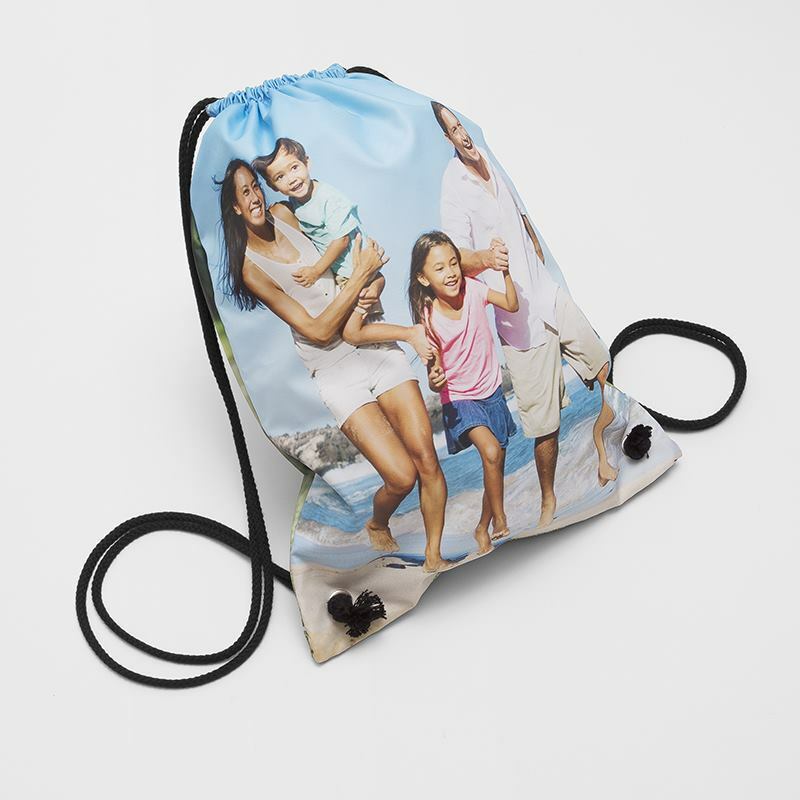 Making your personalized cinch sack backpack as easily identifiable as possible will help to prevent loss and confusion. By the time your children are going to nursery, they've already got an established personality, so let this flourish by getting them to design their own bag for nursery. Little boys or girls who love firetrucks, for example, can draw their own fire engine with them riding it, and you can have it printed onto this drawstring bag for a totally unique accessory. Letting them be creative can help to ease them into nursery life, and make them feel less anxious about the prospect. We suggest printing their name, name of the school, teacher and class if applicable, in case it ends up in Lost Property. You have two sides to personalize, so you can essentially get two bags in one. Give each side a totally different look and feel, so your child can switch around the bag according to their outfit each day. For style-conscious toddlers, this is a great way for them to use their creativity in a different, and novel way.